Collection may be available by calling ahead and setting up a collection time. The Forks Community Hospital Laboratory is a full-service laboratory which supports inpatients, surgical, and emergency services. 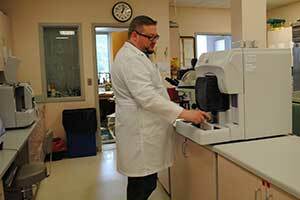 Forks Community Hospital Laboratory also provides outpatient specimen collection services and connects our medical providers to a greater network of specialized testing and pathology services. The laboratory is equipped with the latest instrumentation to support a wide range of laboratory tests. 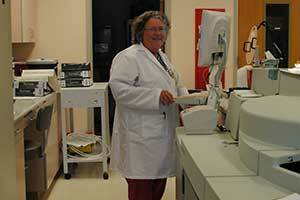 The laboratory is staffed with licensed medical technologists and medical laboratory technicians. You must register before having your lab test performed. When you arrive at the hospital, sign in at the front reception admitting desk. After you are registered, they will direct you to the laboratory. A laboratory technologist or medical laboratory technician will summon you for your test. When should I be fasting? Fasting requirements are primarily for Lipid (cholesterol) profiles and glucose testing. Fasting means no food or drink (besides water) for 8-10 hours prior to blood draw. Continue taking medications unless specifically directed not to and drink plenty of water. How do I get the results from my tests? Generally, we encourage you to follow-up with the ordering provider for your results. This allows them to make interpretations specific to the reason(s) for performing the tests and provide further instructions for continuing or changing medicines, change in follow-up care or needs for additional testing. You do, however, have access to your results at any time by requesting your records. You can click the link above under “Patients & Visitors” to find the Medical Records Request form. Follow the directions to submit the request or drop off your request at the Medical Records Department across from the Laboratory Monday -Friday, 8:00AM-4:30PM. Allow a full day for routine tests and a week for special testing, pathology, and cultures. Also, you can sign up to access the Patient Portal on-line through a secure web site by signing an enrollment form which is offered to you when you register at admitting. Allow three business days for the enrollment form.